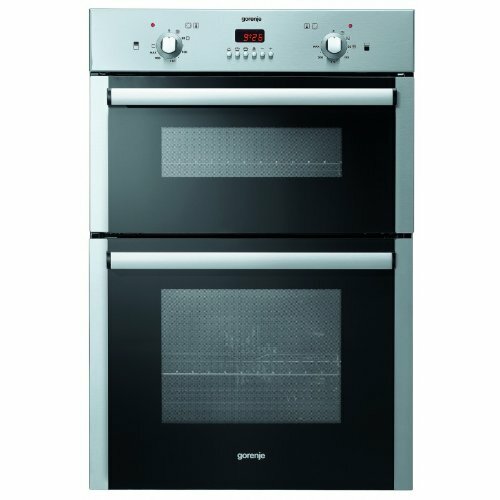 The Gornje BD2116AX - UK Electrical Double oven is sleek and modern in design. It combines function with style and a classic approach to ensure that you get a top quality appliance.This single oven has a 58 litre capcity giving you a spacious vicinity in which to cook in. There are 2 Ovens, giving you ample space so that you are able to cook a large meal all at once, or separate foods saving you time and energy, also saving you money. It also has a aqua clean technology by Just pouring half a litre of tap water into a baking tray, place it into the cavity and select the AquaClean option. The steam generated by the auto-heat programme (70°C) acts to soften the dirt on the oven walls. After approximately half an hour simply wipe down the oven with a soft cloth. Using no cleaners whatsoever, the result is astounding as well as environmentally friendly, this simple design saves you time and money. The BD2116AX - UK is designed with an internal light giving you the security to keep an eye on your meal. The digital timer is gives you the freedom to do other things whilst putting your mind at rest knowing the Gorenje cooker will let you know when you meal is ready.